There was panic in some of the states where the rulling APC held its congress at the weekend. A chairmanship aspirant in Delta State was stabbed to death moment before the exercise got under way. Pockets of violence were also recorded in Imo State, Oyo State, Ajegunle and Isolo both in Lagos. The Ajegunle violence claimed one life. Killed in Delta was Jeremiah Oghoveta, who had declared his interest to lead the party in Jeremi 3, Ughelli South ward 10. He was knifed to death allegedly by one Tete in the heat of an argument over the hijack of electoral materials by a side involved in the process. The Nation gathered that Oghoveta had protested over the alleged hijack of the materials. Oghoveta died on the spot while the Tete fled. The Police Public Relations Officer of the Delta State Police Command, Andrew Aniamaka (DSP), confirmed the incident. He said investigation into the matter was in progress and the police were on the trail of the suspect. The APC leader in Delta State, Olorogun O’tega Emerhor,said the exercise was generally peaceful in other parts of the state. He said APC was poised to entrench the principle of internal democracy in order to have a stronger party that could take over the state in 2019. Leader of the party in Ovu ward, Ethiope East local government area, Chief Frank Kokori said the process went well. Kokori who said the party is waxing stronger in the state, explained that the congresses being held across the country is a preparation awaiting the main election coming up next year 2019. The process was also generally peaceful in Aniocha South Local Government Area was peaceful, although there were few wards where parallel congresses were held. Former Speaker of the Delta State House of Assembly and chieftain of the APC, Mr. Victor Ochei said the congress was conducted without rancour, and praised the adoption of the option A4 adopted for the exercise. Controversy trails APC congress in Imo. Party faithful waited endlessly in their respective wards for the congress to commence. Supporters of the different stakeholders, especially governorship aspirants clashed. The state secretariat of the party where the Congress Committee was billed to address the party stakeholders before the commencement of the exercise was vandalized by thugs who invaded the premises with dangerous weapons. Some of the party officials who were waiting at the secretariat, were beaten up by the rampaging hoodlums. The attack was preceded by the redeployment of the Congress Committee for the state to Anambra State. The APC National Organizing Secretary, Osita Izunaso, said the development was at the instance of the national secretariat of the party. He said: “There is no problem whatsoever, the only thing is that the national secretariat has directed the Imo Committee to go to Anambra and Anambra Committee to go to Imo and it is an internal matter of the party. “There is every attempt by the governor to stop the congress for fear of what will happen but we are going ahead to hold the primary,” Uwajumogu claimed. A fresh round of confusion broke out when it was discovered that sensitive materials meant for the congress were missing. Some of the party stakeholders loyal to the governor insisted that the congress would not continue without the sensitive materials. Angry party members stormed the house of the National Organizing secretary in search of the sensitive materials. Prior to that, the Convention Committee members were whisked to the State Police Headquarters from the Government House on the directive of the state Commissioner of Police, Mr. Chris Ezike. The congress eventually kicked off in the Wards across the state at about 3pm, while the Committee members and some of the major the stakeholders remained in the office of the Commissioner of Police up to press time. A man was yesterday killed during the ward congress of the APC at Ajegunle in Ifelodun Local Council Development Area. The victim, who was injured on the head, died on the way to the hospital. An eyewitness said he was attacked by thugs sponsored by a politician in the area. A video recording of the incident showed the victim lying on ground in a pool of blood. A man beckoned on the people around to take him to the hospital. Another man brought his Sport Utility Vehicle (SUV) to assist the victim. The victim was carried into the vehicle, and he drove away. Similar confusion erupted at the ward in Isolo Local Council Development Area (LCDA). Some party members alleged that ballot materials were in circulation. 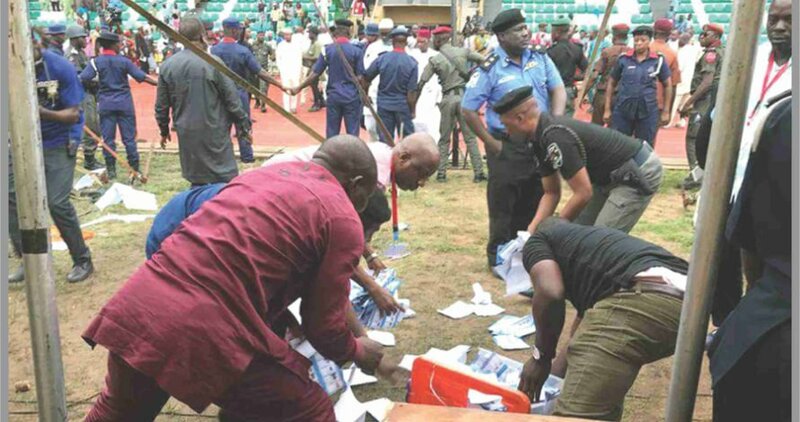 Hoodlums, wielding guns, knives, cutlasses and other dangerous weapons, soon hijacked the exercise and descended on delegates many of whom were left injured. The party secretariat situated at Onawale Street, Isolo was vandalized by the hoodlums and congress officials chased out of the building.